I've tried to post some sensor examples in the main Slim Node thread. It's continuously growing and I think it's better to start new threads for as much as possible. Here's one. I used this Si7021 (GY-21 board). Here (and often in other projects as well) the GY-21 board is used to provide the Si7021 sensor . I'm not sure about the identity of components on it, but apart from the sensor the board also includes a small 3.3V-regulator (LDO), mosfets for logic level convertion, supporting capacitors and pull-up resistors. The voltage regulator is desoldered and bypassed in pictures above. This gained a node sleep current reduction from 10.7uA to ~6uA. This is the only modification necessary to do on the GY-21. The GY-21 board is obviously designed for 5V-projects, but removing-/bypassing the v-reg is enough for using it in our low power 3.3-1.9V applications. @riataman was the first to show the mod of the GY-21 board in this post. There's also a link to a board without the v-reg and level converter. If you design you own pcb you'll probably use the Si7021 bare chip instead of the GY-21 board. I had some thoughts about voltage dropout level and the level converter. In the end I still have thoughts, but my experiments show no issues. Here's a description of the level converter working principle. Remember that I don't know if these specs are equivalent, but looking at the mosfet datasheet, it says "Diode forward voltage drop 0.85-1.5V" and "Gate threshold voltage 1.0-2.5V". It's also an "Enhancment mode" FET, where the threshold voltage is important according to this. All together makes me worried about the High side capability to pull down Low side when High side volt is <2V instead of 5V. My tests show differently though. There are no real issues with this. The Si7021 worked down to ~1.7-1.8V with no significant difference whether the level converter was bypassed or not. Comparing one node with bypassed level converter to one without, showed ~1uA lower sleep mode current. But I assume it could just as well be a matter of the individual variations. If anyone like to bypass their level converter, here's a picture. Thanks! I asked in the main thread, but what ceramic capacitor are you using there? I see the 4.7uf, can you confirm what the other is? If I get the orange capacitor and the black one, are those the only capacitors I need for a si7021 temp node? The capacitors are part of the Slim Node design, they have nothing to do with this particular sensor. It's C4 and C5 if you look in the BOM. The one you asked about earlier was just a bad example by me where I had put what had at the time, which was the "C1,2,3" type of cap. The caps are sort of belt and braces here. Your node would probably work without them (ie C4,C5), but maybe with a little worse performance. @m26872 thanks, I've now ordered the missing parts, so hopefully once they arrive I'll be good to go. Added the "Notes" part in the first post. I really loved your slim node ! Nice job ! The power consumption seems the same with the SI7021 and a DHT22 ? @carlierd You're welcome! It's "licensed" Public Domain, so use it as you wish. But of course - please make it open hardware if you come up with something. I only measure the sensor nodes total sleep mode consumption and since the DHT22 requires a 3.3V booster (Iq ~90uA) it's hard to tell if it's exactly the same. @m26872 : I don't use booster. You think it's necessary ? 90uA is really important for battery operation. @carlierd What's your setup then? 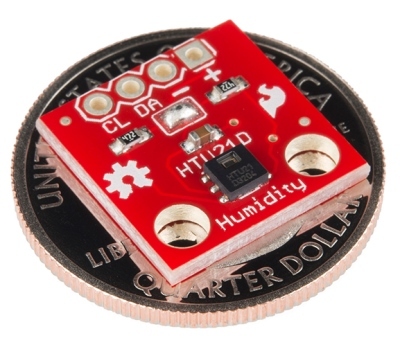 The DHT22 is for 3.3-5.5V. 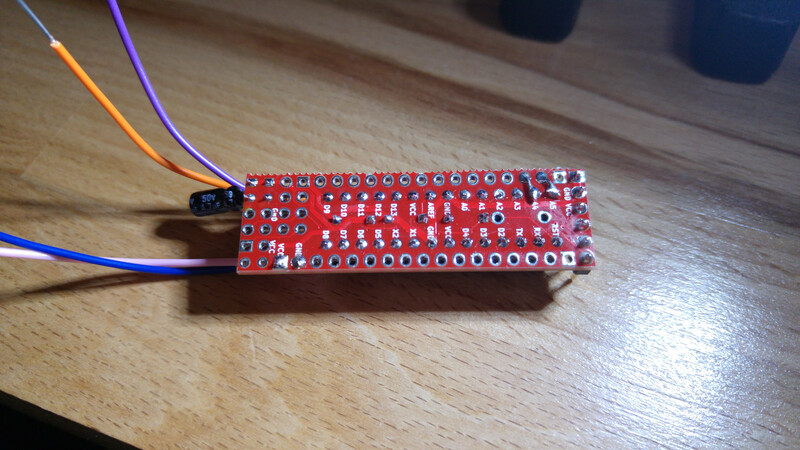 @m26872 I have built the Slim Node described above and i am using your exact sketch given above but when i look at the serial monitor, it is printing junk characters i tried different baud rates on the serial monitor but nothing works. I am connected to the slim node using FTDI board. @ar91 Did you change baud rate in MySensors config too? @m26872 There is another version of the SI7021 board without voltage regulator. This evening I will look up the link on Aliexpress. The boards are smaller then the GY-21 variant. Thanks @m26872, I changed the baud rate on MyConfig.h and it started working. @m26872 My nodes are working correctly for the moment. Actually one is at 2.8v. Perhaps I will have problem when voltage will be lower ! @carlierd Probably. That's why I ask what you use. DHT22 connected straight to 2AA will not utilize battery capacity. Higher battery voltage with step down regulator would be better - or maybe without, but with like 3AAs or so. @carlierd With Slim Node running at 1Mhz even with or without booster i am having hardtime making DHT22 work. I even tried different libraries but none of them works at 1Mhz. How did you get it work? @ar91 I don't think there's a good reason to go below 8MHz if DHT22 doesn't work much below 3.3V ? @m26872 Perhaps that with a caps I can go very low. I want to have at least one year on 2 AA. Wait and see ! @ar91 Hello. I am using the arduino playground lib. No issue with it ! I can post a sketch if necessary. @carlierd If you could share your code that will be great. @ar91 Please find the code I used in 3 different nodes. The good thing with the playground lib is that there is error message if dialog with DHT22 failed. A question though. To get to this point, I copied the pictures posted above, but where do I now add these resistors? Also, if I want to add a 2AA battery cage, where do I connect the red and black wires to? Thanks! And sorry for the newb questions! @rsachoc What you show are not resistors, they look like capacitors. 104 means 100nF (I think). Can you measure their value ? @carlierd Are you running your Atmega at 1Mhz, Because I tried to use your sketch and i am getting "Checksum Error". No, I am working at 8 MHz (internal). Perhaps your DHT is out of order ? You try with another one ? Bump, can anyone advise on how I got about finding out where I need to solder the resistors on? So far I've just soldered the 4.7uf capacitor, as can be seen from the pics. But I'm struggling to find out where I need to solder the other capacitor's I have (from the BOM). @rsachoc C1,C2,C3 are clearly marked at top layer silkscreen. You'll see them in the middle of the uC socket if you look at your 2nd picture in you last post above. C5 is visible next to the 4.7u cap, in the 3rd picture of my first post in this thread. First picture in first post of this thread should be enough. Connect (+) to Vcc and (-) to Gnd. Thanks, apologies, I really should have looked at my board, I was searching for the answer in the main slim node thread and I think i was looking at older boards and couldn't for the life of me find where C3 is! @rsachoc I'm sorry, I know I need to update those old pictures. @m26872 no problem, not your fault at all, mine for being a newbie. So much so that my first attempt resulted in me soldering the capacitor to the wrong hole, so I've had to abandon my first attempt. You live, you learn, next time I'll double check. @rsachoc Yes. Double check polarity of the 4.7uF cap. I have now successfully built (I think) the slim node, but without the 7021 temp sensor. Because this is the most expensive part of the device and because I find desoldering a challenge, but mainly because I'm waiting for it to arrive from China, can I try and upload the bootloader and sketch without the sensor attached? If so, I had a couple questions from reading through this thread and the slim node thread. Firstly, uploading the bootloader, can this be done with the FTDI adaptor or do I need to follow the bit described in the slim node thread and attempt it using AVR studio? Secondly, once that is done, is it just a matter of uploading the sketch provided above? 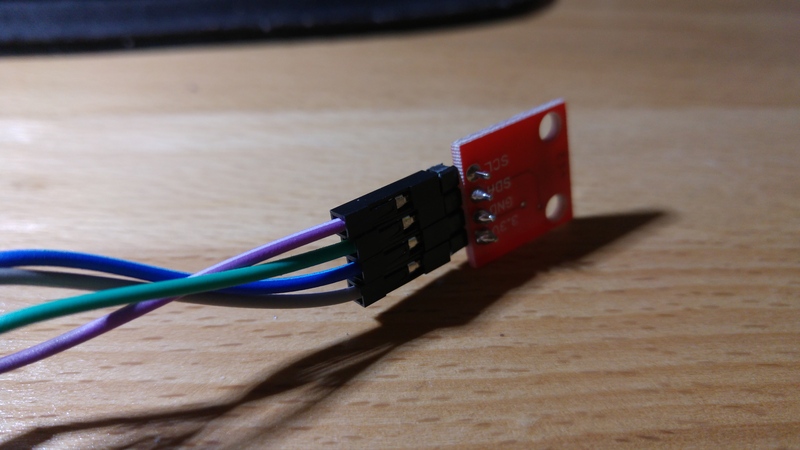 Also, I wanted to confirm a few things on attaching the si7021 temp sensor. From what I can see, SOA (SDA) on the si7021 goes to A4 and SCL goes to A5. Also, GND goes to GND on the board (rightmost set on pins bottom right when FTDI is at the top) and VIN goes to VCC (just next to GND on the board)? can I try and upload the bootloader and sketch without the sensor attached? Yes, you should be able to get far without the sensor. Send something over MySensors net and view debug prints. Or make some simple sensor like a reed switch. uploading the bootloader, can this be done with the FTDI adaptor or do I need to follow the bit described in the slim node thread and attempt it using AVR studio? Yes, Avr Studio or Uno as ISP. Secondly, once that is done, is it just a matter of uploading the sketch provided above? Yes, but if you don't connect a Si7021 I would go for some other simple test sketch to avoid any Si7021 library startup issues. Folks, a word of caution, for people that are attempting this for the first time, please burn the bootloader before you solder everything, as silly me, I built the entire thing (without the si7021) and now I'll need to bin it because the ATMega is soldered to the board and I've no way to load the bootloader soldered to the board! I think what I'll do is once I've actually got a working board, I'll do a newbie writeup so that people don't make the same mistakes as me. First Attempt In Learning A writeup would be awesome. @rsachoc Why don't you just solder some wires to pins you need ? The "in cicuit serial programming" concept would let you do it with almost anything attached. I might as well attempt that! I'm waiting for a breadboard, so I'll try and attempt it when that arrives. I prefer using strips for the Atmega (see here) as you'll have more clearance for the capacitors which sit underneath (there is a caveat to this however, in that if you're not sure if you've got/burnt a bootloader onto the ATMega, using strips there is no going back, whereas with the chip socket, you can remove the ATMega). 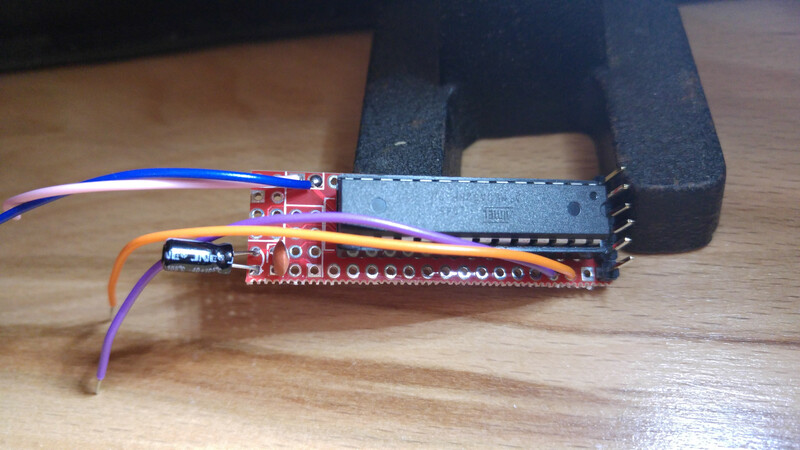 Update I think, for me anyway, if you're confident that the ATMega has been bootloaded successfully, I still prefer strips, however if you're unsure what you can do is use the socket and just sit it higher in it's position to get a decent clearance. Check the size of the box/fitting you are going to mount this in before you do all the above! Check that you are putting the ATMega chip the right way on the board, the notch should be facing the pins for the FTDI. Check continuity of the pins from the ATMega to the board pins underneath, I found the ATMega to strips were the most difficult to solder, and after I tested continuity I found a single pin which didn't have connection, so I added some more solder to this pin. 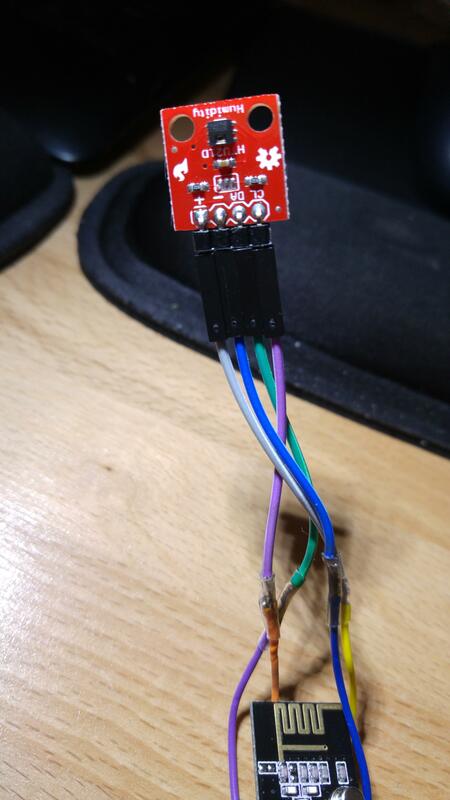 I strongly advise buying the 3.3v ready si7021 temp sensor (here) as the modification to the 5v version is quite difficult for a newbie (the components are quite small) and you'll probably mess it up like I did. @rsachoc As a great man once said: "most bananas grow bent, and yet everyone loves them. There is nothing strange about the diversity of routes to success"
I'm using the W5100 MQTT gateway sketch (which I believe is on the development branch), so I'm not sure if that's what's causing the error? I've tried deleting the Arduino IDE, the mysensors development branch from my PC, and reinstalling and redownloading the mysensors dev branch, but the same thing happens? OK, so it seems that it was because I was using the dev branch that I'm getting that error. I switched over to stable and the sketch compiles, although I do get a warning. @rsachoc I sorry, but there seems to be an error in the sketch in the first post. Baud rate should be 9600 everywhere if you use the common Slim Node fuses and bootloader. Upload (board.txt), MyConfig.h (not MySensor.h since v1.5), Debug-prints and Arduino IDE serial monitor. Thanks, I've updated the sketch that I downloaded, also myconfig.h so that should be good. What do I need to select in the Arduino IDE for board type? I searched in the slim node thread and didn't see a reference to any changes? @rsachoc No changes. It is that boards.txt entry you should use. Hmmm ok, that's what I thought...still no luck, I've modified the boards.txt with the text from the slim node thread, and now it still has the same error message. Other than that, I guess it may be something wrong with the way I made the board? If so, what's the best way to troubleshoot? Could it be a bad bootloader flash? 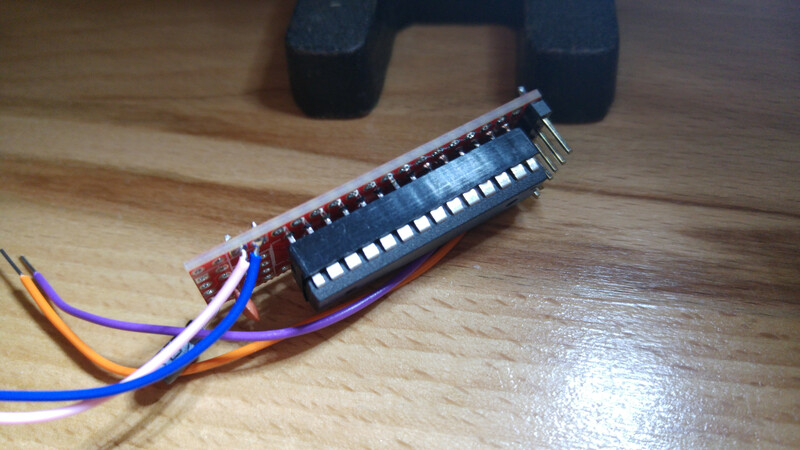 Is there a way to check if the ATMega has a bootloader? edit in fact, it could be because I don't have the Si7021 connected? Could this be the reason a sketch is not uploading successfully? @rsachoc Start simple. Try on a board without nRF and sensors. Remove everything in the sketch and make it to just print "Hello world" back to serial monitor. Thanks, I haven't actually built a new node, but have been double checking everything on my current node. One thing I wanted to confirm, the 4.7uf capacitor, does the negative leg have to be on the corner of the board, as this is the way I have it currently? I think looking at the board layout in the main slim node thread, it should be the positive leg on the corner and the negative leg on the side of the board (the short side of the board)? @rsachoc I don't have it in front of me rigth now... but, there should be an arc and a super-small "+"-sign next to the positive pad. Maybe it just look like a dot. edit to confirm the positive leg of the capacitor goes to the positive marked plus sign hole on the board? OK so I changed the polarity of the 4.7uf capacitor and I'm still receiving the same error. So I built a barebones one without sensor and without NRF. I am still getting the same error when uploading the sketch via the FTDI adaptor. 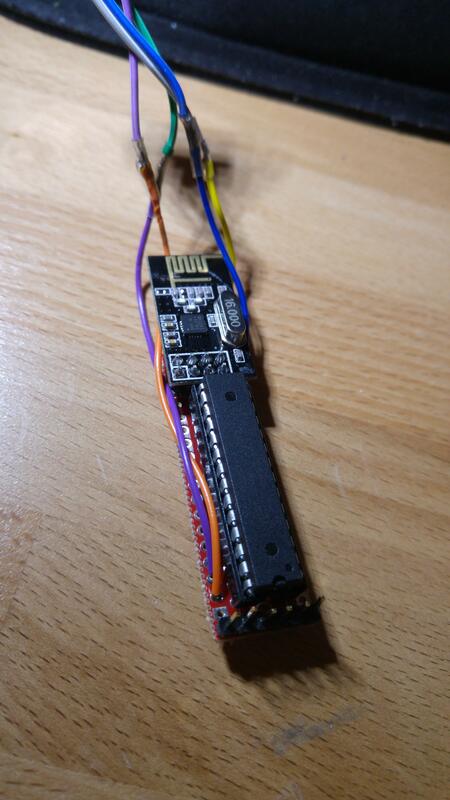 I tried uploading a sketch to a Sensebender I have and it worked fine, so that rules out the FTDI adaptor. Some pics in case someone can spot something obvious. So I can only think that it must be related to the ATMega bootloader? In the how to burn a bootloader thread, I received the following when trying to burn the bootloader, so I assumed it uploaded correctly? System wide configuration file is "C:\Users\James\Desktop\RPi Openhab\arduino-1.6.7-windows\hardware\tools\avr/etc/avrdude.conf"
avrdude: reading input file "0x3F"
avrdude: reading input file "0x05"
avrdude: reading input file "0xDE"
avrdude: reading input file "0xFF"
avrdude: reading input file "C:\Users\James\Desktop\RPi Openhab\arduino-1.6.7-windows\hardware\arduino\avr/bootloaders/optiboot/optiboot_atmega328.hex"
avrdude: reading input file "0x0F"
@rsachoc Looks like you're missing the R1 resistor? It lives! Well the one node I created does at least! I'll troubleshoot it, but the problem was the R1 resistor, which I (noobishly) forgot about! But very pleased, and thanks to m26872 especially and everyone else who helped. I've updated the lessons learn post too! So the DHT22 works at 1MHz with 2 AAs and your code you´ve posted? No physical differnces? What I'm trying to figure out is where the temp and humidity reading are so I can get them into MQTT/OpenHab. Looking at the output, I can't see which one is the temp, humidity or battery level? @rsachoc Is that all you get? Please also set sleep_time to 15000 for debug, if you haven't already done it. @m26872 thanks, I've set that, no change even after more than 15seconds and debug set. Did you try your Si7021 on some plain arduino first? Just with some simple example code. @m26872 thanks, yes, I guessed that something might be wrong with the sensor, I checked continuity between the board and the sensor and all seemed fine. To test on an Arduino, I've honestly very little clue how to do this. Could I utilise the breadboard and Arduino I used to flash the AtMega? @rsachoc The "very little clue" is a good reason to play around and learn some. You should not use a 5V Uno directly to sensor without voltage regulator and logic level converter. The Si7021 spec is 1.9-3.6V. If you don't have a Arduino Pro Mini 3.3V, I suppose your best option is the SlimNode you already got. Try it at least at 8MHz (use suitable fuse settings, bootloader and baud rate), of course external crystal if you have. The most SI7021 coming from ebay are with voltage regulator and level shifter. I searched for a raw version and there are only very few... If you are not sure, post a link or a foto. @rollercontainer Thanks! You're absolutely right. I feel rather stupid not thinking of this. So @rsachoc, if you're have some GY-21 like boards still not yet modded like described in first post of this thread, then they should work excellent with your Uno. Thanks both, I have the "pre-modded" si7021, so it's the one that should operate at between the 1.9 and 3.3v. I the Arduino I used to burn the Atmega is a knockoff, so it has both 3.3v and 5v. Let me do some research and see if I can test the si7021 using it. @m26872 oh! I didn't realise I needed to do that, could that be the problem? Do I just need to fill with solder the bit just below where the DA and "-" is? @rsachoc It's probably it. And yes, it's rigth there. Make sure all of the three small pads interconnect. @m26872 thanks! No time tonight, but a job for testing tomorrow. You could also use the 328 pullups! I had an unwilling Chinese light sensor (MAX44099) that drew a lot of power either with the VCC on or off. Since it's battery powered that is undesireable. I used digitalWrite(SDA, LOW); digitalWrite(SCL, LOW); to tie the bus to ground. When the sensor wakes up, it writes HIGH to those pins and the bus is back online. Used a 500ms wait after this to let the sensors stabilise. That sensor is now on a 6µA sleep current and a average 128µA over 2 hours measured with a 2 minute sleep cycle. Tried it this evening, still no luck, let me see what I can get up to over the weekend. @DavidZH True, internal pull-ups (20k?) should probably be enough for the normal i2c use (short wires, low speed, etc). But I wonder if pull-ups are consuming any significant power during passive state like sleeping sensor. Of course it's a good solution in case there're issues preventing the bus from beeing silent. Or worse, pulled down continuously. What was your current before the change? I think 500ms awake is a lot. @rsachoc Crap. Maybe it's something else then. I switch them off with a LOW write before the sensor goes to sleep and you're absolutely right about the wait time being very long. In this case I didn't mind because the sensor is powered by a solar panel. I can't really remember what the exact value but it was an order of magnitude... I also used the voltage divider way to measure voltage because the Moteino has a regulator on board, so that upped the sleep current a little (10M resistor to keep the current low). I went searching because the current went UP when I switched the power to the sensor off before sleep. Gammon.co.au is a very useful source, but I can't remember where I dug this hack up. According to the datasheet the absolute maximum time to get ready is 80ms. Thanx! Saves me a trip! I'm going to try get everything on a breadboard, but now I see fails, what's that all about? @rsachoc google "mysensors st fail"
I am currently trying to use that red 3.3v module too and it doesn't seem to work. I have the sketch from above running with the "normal" blue module where I remove the voltage converter so that it works at 3.3V without a problem. fails. Does anyone have one of these sensors up and running? Any ideas where the error is? Otherwise I guess I have to stick with the blue ones. The red ones are HTU21D and need another library (they are different from the SI7021). 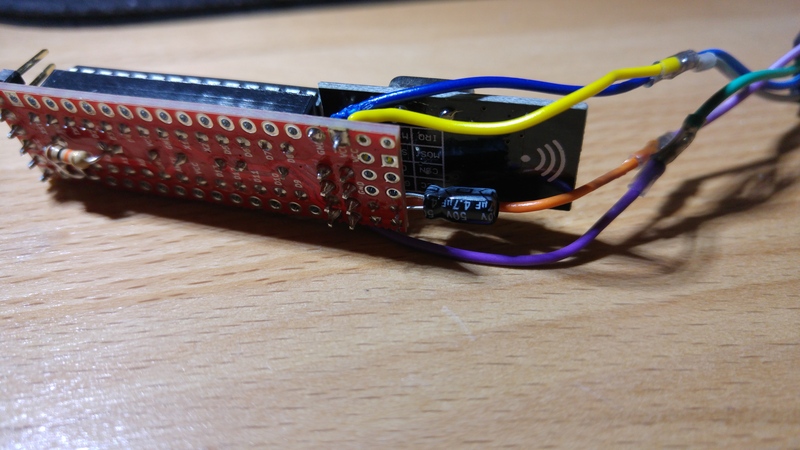 Use the Adafruit library for this module (look on their site for HTU21D). I guess if that's the problem it should have been obvious to me, it even says HTU21D on mine! Silly me! Either one of these libraries will work with the HTU21D modules. Both modules do the same, but have different I2C adresses so you can actually use both at the same time (of you like to compare them), but you need different libraries to call each one. I will try that out tomorrow. @LastSamurai I'm having a go as well at updating the .ino file with the different library, but I'm not a coder so I'm "having a hack" - if you have any luck could you post your code? @rsachoc Yes, I actually just tried it out and its working. @LastSamurai thanks, progress, I'm getting this now, which means it's working! Finally, a working node from a complete rookie like me! I think that the readings are not accurate though, not sure why, but I'll have a go at figuring our why anyway! @GertSanders Thx a lot for your help! I had no clue about the HTU21D lib. so with the correct library there is no need to solder those 3 spots together!? The "spots" are there to connect the pullup resistors to the SDA and SCL lines. This is always needed, regardless of the library of the board onto which you connect the sensor board does not provide pullup resistors itself. On a minimal board like the one in this thread, this is not the case, so the pull up resistors are needed. ok, thanks for making it clear for me Gert!! seems to be okay, isn´t it? I have 2 reed switches attached. I recognized that I have +0,10 mA for each reed switch when activated. So when reed switches are both touching their counterpart I have a sleeping consumption of 0,20 mA. Why is that?? Then I chech the Si7021 library, and how I saw there wasn't member 'humidityPercent', but there was a member 'humidityBasisPoints'. Temperature looks ok, but Humidity value jumping a lot, thats why I don't want to believe it is true. Could someone, who has a 2.0.0 library and Si7021 sensor chech is it same situation? Becose I have only one Si7021 sensor. Maybe someone could look also on the code and say if I convert it right? @jacikaas where did you get the si7021 library? Take a look at the sensebender sketch for a good reference.